Apple finally, officially unveiled the iPad Mini at the company's media event on October 23rd at the San Jose’s luxurious California Theatre. After listing out all the features, specs and abilities of the tablet, the company announced that the mini tablet will be released on Friday, Nov. 2. The iPad Mini’s Nov. 2 release date was basically scheduled to be held on Oct. 16, explaining that Apple needed enough time to build hype for the product before its public launch, but it also needed to avoid Microsoft’s big week this week, which sees the launch of Windows 8 and the company’s first-ever tablet, the 10.6-inch Surface. The iPad Mini is incredibly thin and light. The iPad Mini is just 7.2mm thick – about a quarter thinner than the fourth-generation iPad -- and weighs just 0.68 pounds, which is more than 50 percent lighter than the newest iPad. That is AMAZING.. The iPad Mini measured to be 7.9 inches diagonally and had a screen resolution of 1024 x 768 pixels. Also, Apple unveiled the new Macs, the new 4th generation iPad and, of course, the iPad mini, carrying the spotlight. 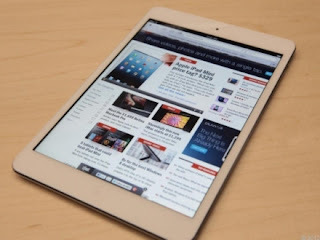 Apple is accepting pre-orders for the iPad Mini from today, but the device will be released on Friday, Nov. 2. Apple will start selling the Wi-Fi model at $329 and a Wi-Fi + Cellular model at $459, both for 16GB. Apple will sell the iPad Mini for $429 and $559 for 32GB, and $529 and $659 for 64GB on the Wi-Fi and Cellular models, respectively. 0 Respones to "APPLE iPad Mini UNVEILED"